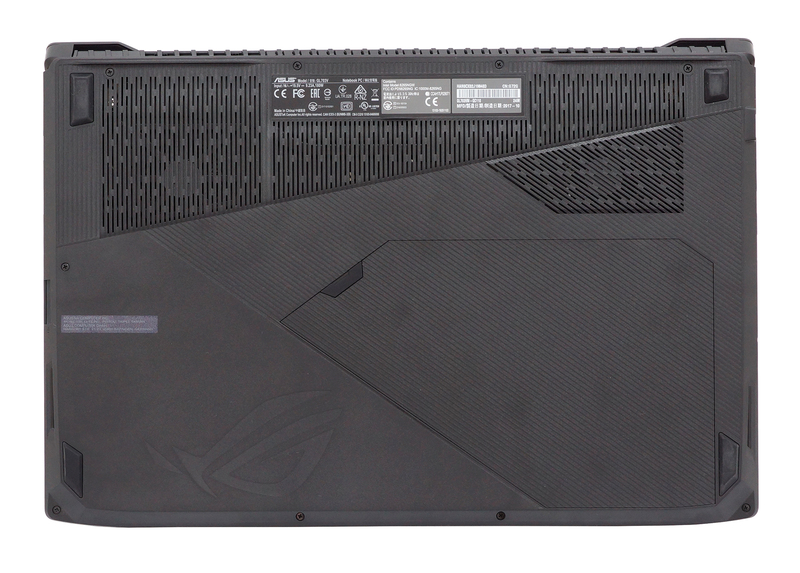 Long months after the initial release of the GTX 1000-series GPUs and only just now, ASUS has released its GTX 1060-powered gaming laptop. That’s, of course, if we don’t count the similarly priced for that time, ASUS FX502VM, which was a total disaster. 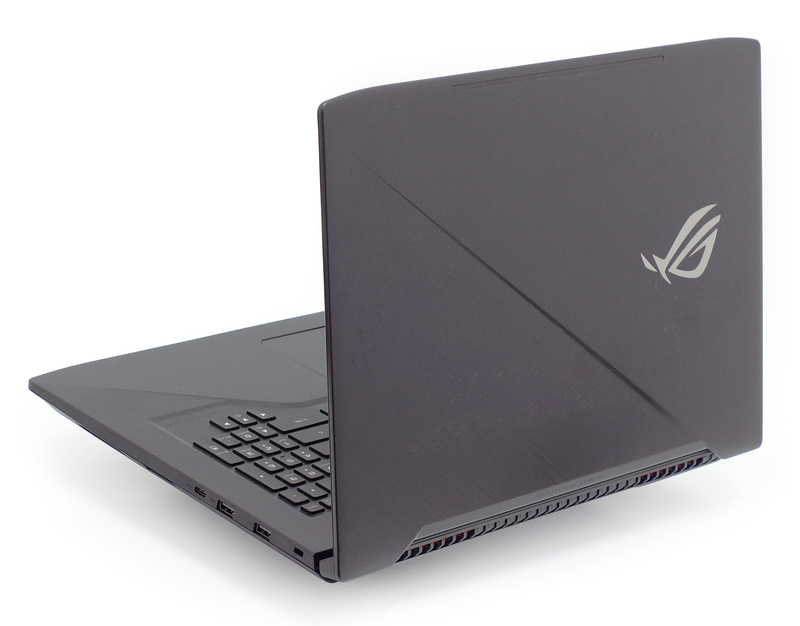 But apparently, the OEM aims to right all wrongs with its significantly more advanced ROG GL703VM. The laptop comes as a direct competitor to the Acer Predator Helios 300 (17-inch), although considerably more expensive and* more reasonably priced than Dell’s Inspiron 7577 and HP’s 1060 version of the Omen 17 (2017). 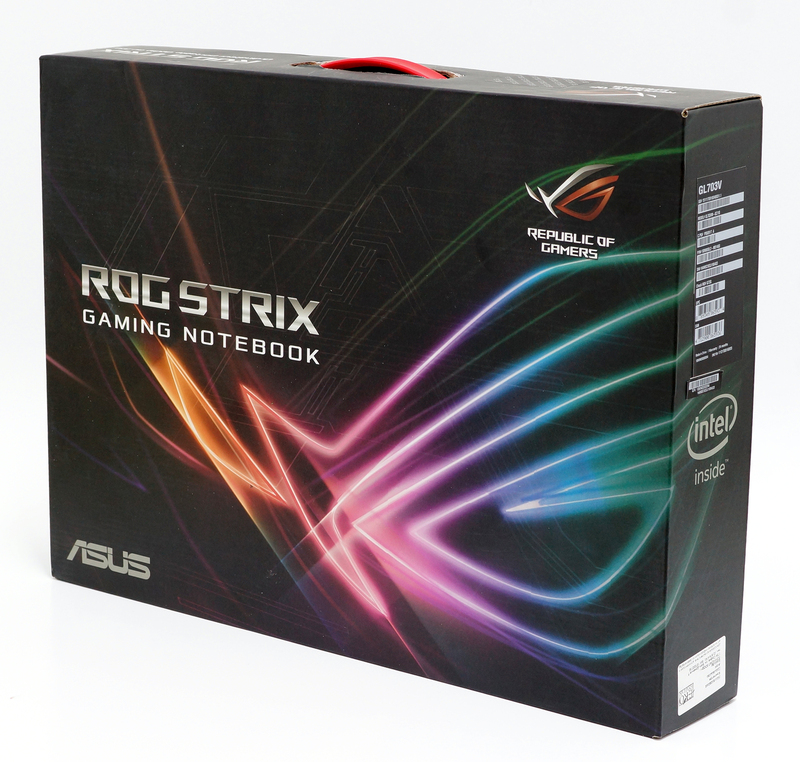 And with an asking price just around the Lenovo Legion Y720, the ASUS ROG Strix GL703VM borrows some distinctive design features from the ASUS ROG Zephyrus and offers everything the competitors do – up to Intel’s Core i7-7700HQ CPU on board, GPUs ranging from GTX 1050 to GTX 1060, up to 32GB of DDR4-2400 memory, M.2 PCIe NVMe SSD + 1TB HDD and a Full HD IPS display – there are also versions with 120 Hz displays which makes it one of the few GTX 1060-powered laptops out there with high-refresh rate IPS displays and G-Sync support. And even before we begin with the review, we can say that the GL703VM might just be the winner in this segment as long as you are willing to deal with some trade-offs along the way. Read the full review to find out more. 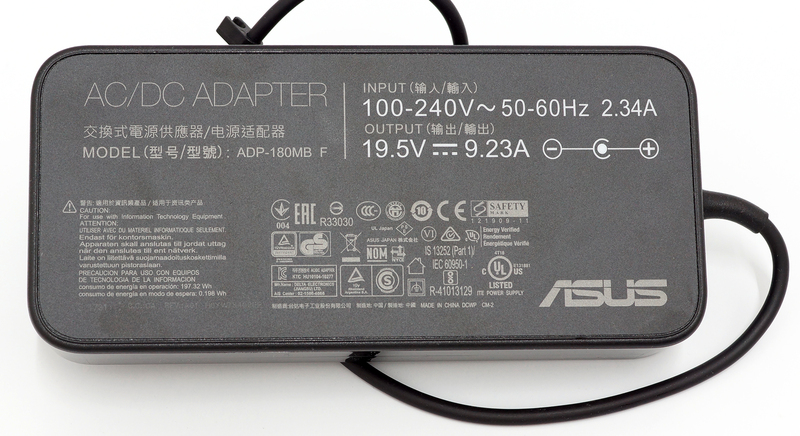 The laptop comes in a cool ROG-branded box containing all the usual user manuals, the AC adapter and power cord. Tipping the scale at 2.95 kg and measuring 23.9 mm in height, the GL703VM manages to incorporate aluminum in its build but most of it is plastic. 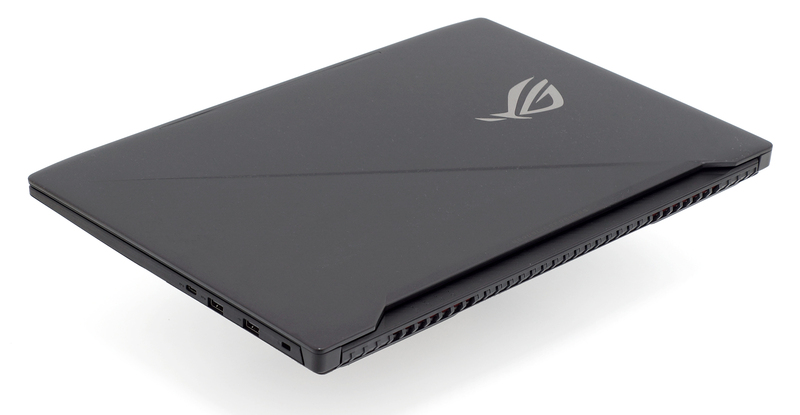 Still, we should give credit to ASUS because the GL703VM is a little bit lighter than most 17-inch gaming laptops out there. Anyway, does this particular model suffer from the same design weaknesses like most of the GL-series laptops? Well, the lid has definitely been fixed – while still incorporating brushed aluminum, the metal sheet feels way more robust now. Pressing the middle of the back panel results in really small deformation while our twisting attempts didn’t show anything worth considering. Another great thing about the new design is its simplicity. 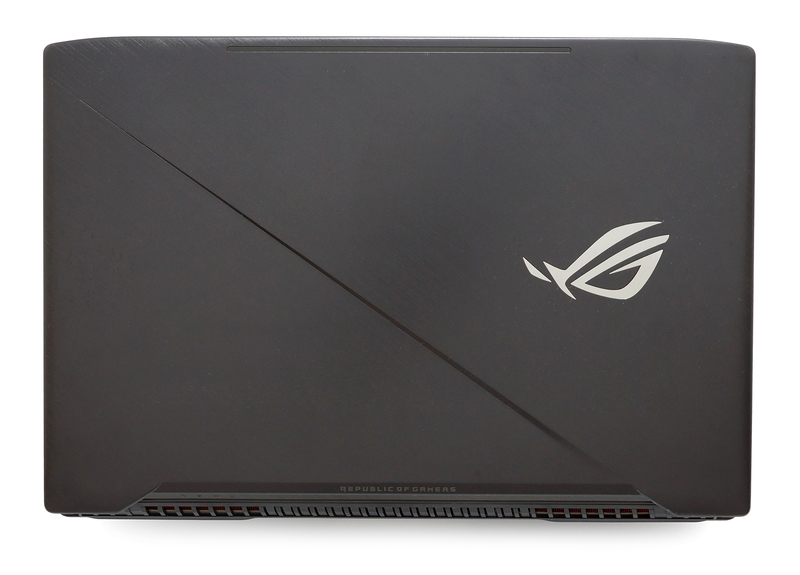 There are no more flashy LEDs and logos – just a chrome-colored ROG logo and brushed aluminum surface. Unfortunately, the latter attracts a lot of smudges and fingerprints. Despite the screen hinges being placed away from each other, the lower chin remains pretty solid and doesn’t give in under pressure. They also provide smooth and linear travel meaning one hand is enough to open the machine. The bottom is made of rough black plastic and incorporates plenty of grills for cool air intake and a big service lid for easier upgrade but more on that later. As we go around the sides, we find plenty of I/O and quite frankly, more than we expected. On the left, you will find the DC charging port, RJ-45 for LAN, mini DisplayPort, full-sized HDMI, two USB 3.0 connectors and 3.5 mm audio jack while on the right, you can see two more USB 3.0 ports, one USB-C 3.1 (Gen 1, unfortunately) and the SD card reader. That’s what we call good port distribution because most of the cables will stick out from the left side and not on the right where your mouse is. 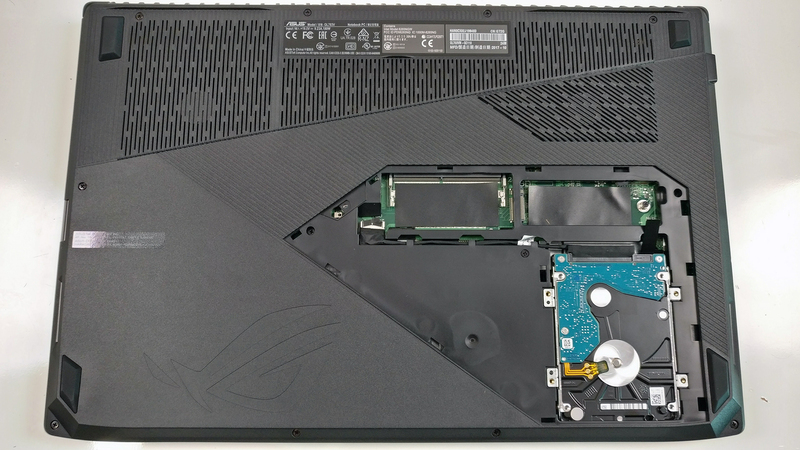 But as soon as we open the laptop, we are immediately reminded of the ASUS ROG GL753 and that’s not necessarily a good thing. A small portion of the interior imitates brushed aluminum surface while the rest is made of silky-smooth plastic finish that attracts loads of fingerprints and smudges. We think that for the asking price, ASUS could have included a more sophisticated base unit made of matte surface or aluminum at the very least. This would have helped with the overall rigidness as well since the middle section and the right area of the palm rest sink in under pressure quite visibly. In addition, the touchpad hasn’t been changed and feels just as mushy and a bit “sluggish”. The gliding surface is good, though. And as for the keyboard, we have some mixed feelings about it. The key travel is rather short but it’s been compensated by the satisfying clicky feedback. This means that it’s ideal for typing but might not suit every gamer out there. We really wished that they would have gone for the keyboard on the previous ROG GL752 – much deeper travel suitable for gaming. In any case, the slightly concaved keycaps make up for a great typing experience while the shortcuts for the microphone mute, volume and the ROG center and the customizable RGB backlight are a nice finishing touch. The arrow keys could have been bigger but they are well separated from the rest of the keyboard so those shouldn’t be a problem for most of the users. 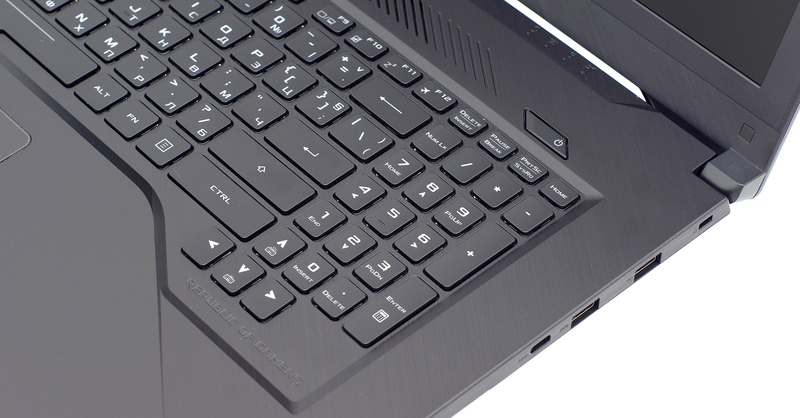 All in all, the GL703VM definitely feels as a step forward compared to its predecessor but we can’t get over the fact that it still uses that bad touchpad design, too plasticky interior and the shorter key travel of the keyboard, although the latter shouldn’t be a deal-breaker for most. It has some kind of a unique but comfortable feel to it. We can also call the GL703VM a fairly portable 17-incher but still isn’t close to the 15-inch form factor, just keep that in mind. 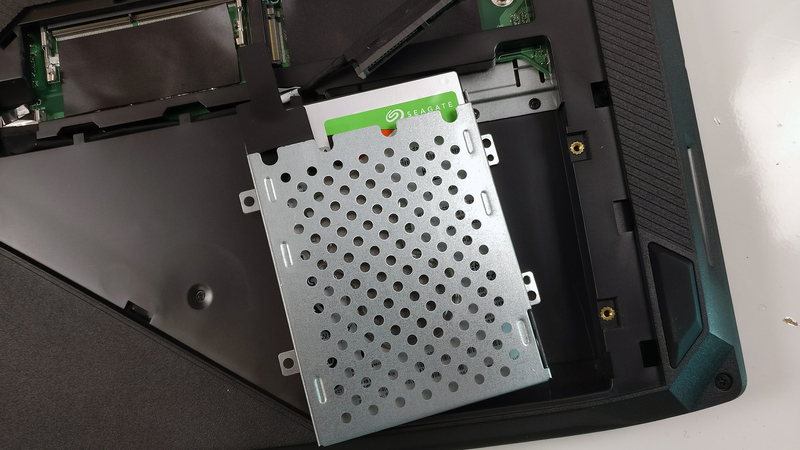 There’s a huge service lid on the bottom giving you access to the storage and one of the memory slots. 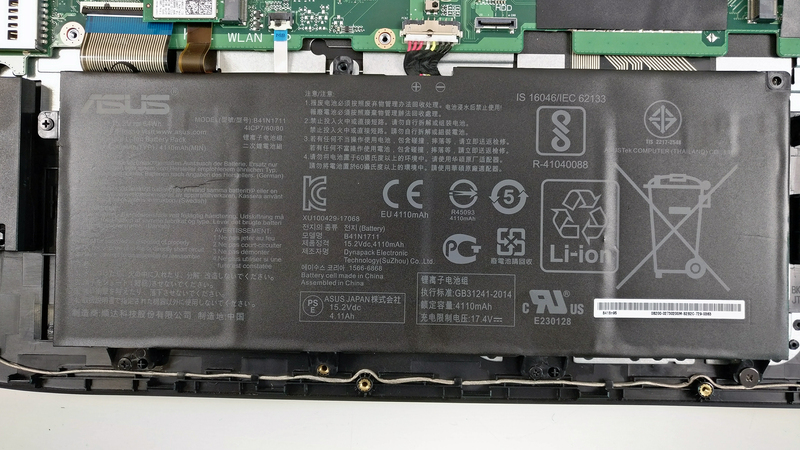 It’s really easy to remove it but if you have to replace the battery or stick a bigger RAM chip in the other slot, you will have to remove the whole bottom plate. 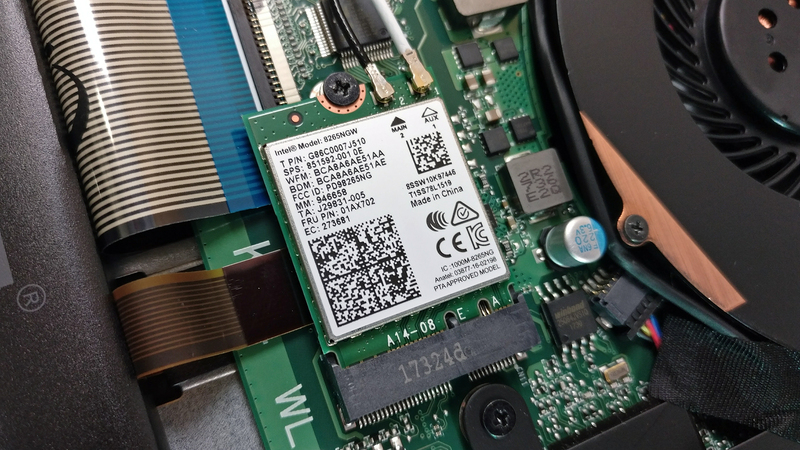 The laptop comes with a standard 2.5-inch HDD/SSD slot and the usual M.2 SSD slot supporting PCIe NVMe drives. The unit we got had only the 1TB Seagate HDD while the M.2 SSD slot was empty and available for upgrade. 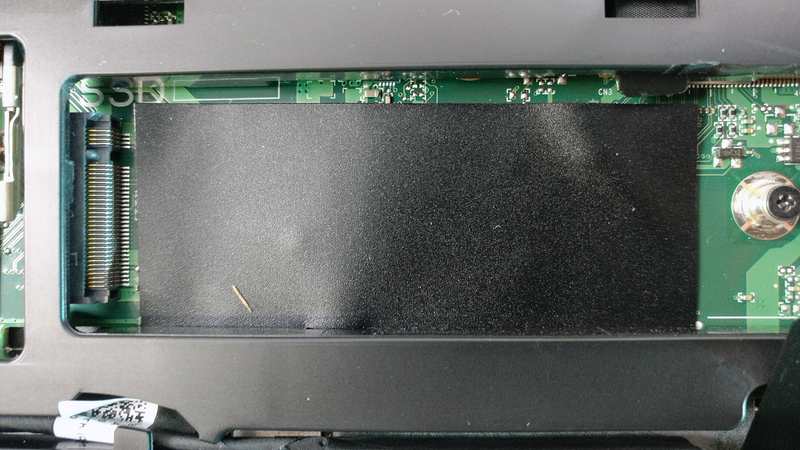 As we’ve already pointed out, one of the RAM slots can be accessed via the service lid but if you want to reach the other one as well, the whole bottom has to be removed. 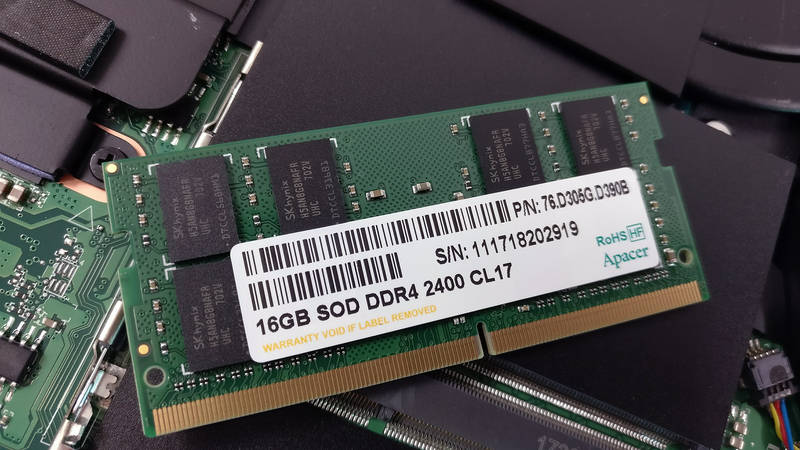 Both slots can carry up to 16GB of DDR4-2400 each. 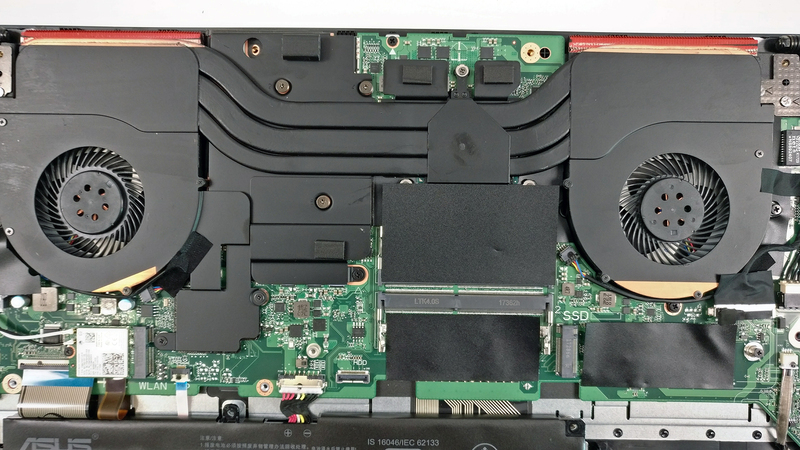 The Wi-Fi adapter is right next to the left cooling fan (with the bottom facing up) and it’s Intel 8265NGW. The notebook comes with a generous 64Wh unit placed under the wrist rest area. The cooling design takes a more conventional approach with two separated cooling fans and three large heatpipes connected to both heatsinks. 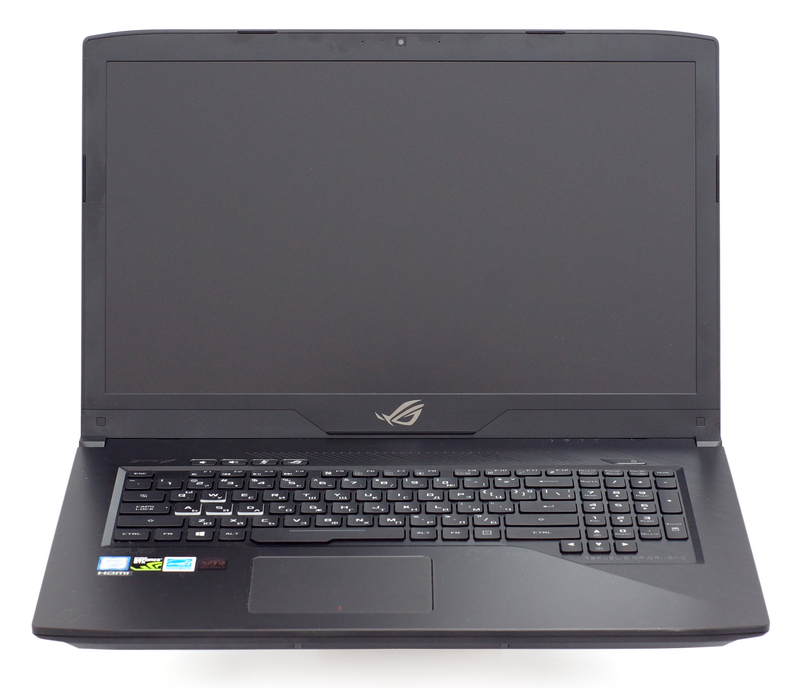 The ASUS ROG GL703VM sports an already familiar Full HD IPS panel from LG with model number LP173WF4-SPF5. 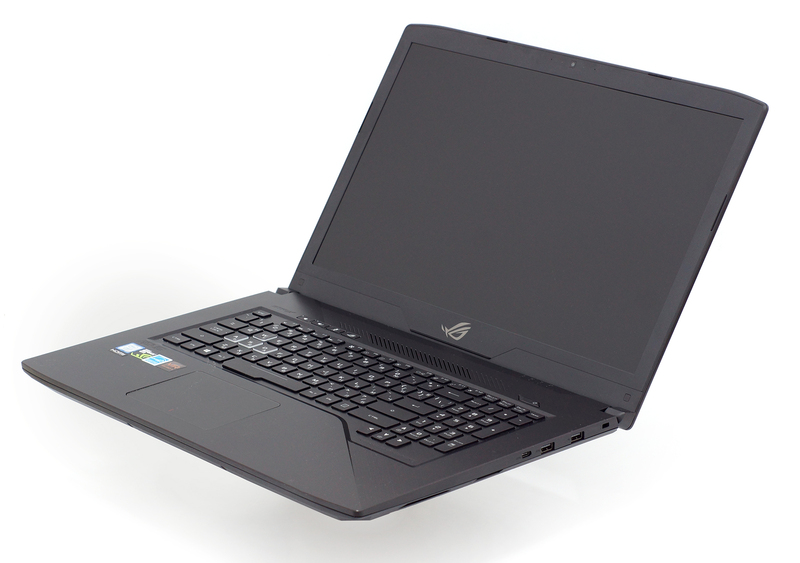 It has also been used in the recently reviewed Acer Aspire 5 (A517-51G) and the Lenovo Legion Y920. We have only nice things to say about it, to be honest. Anyway, the resolution is 1080p (1920×1080) with 127 ppi pixel density and 0.1995 x 0.1995 mm. The screen can be considered as “Retina” when viewed from at least 69 cm. We’ve measured peak brightness of 375 cd/m2 and 360 cd/m2 as average across the surface with just 11% maximum deviation. The correlated color temperature on white screen is 6960K at maximum brightness which is just a little colder than it should be. Going along the grayscale, the color temperature goes closer to 7000K and you can see how these values change at 38% brightness (142 cd/m2) on the image below. 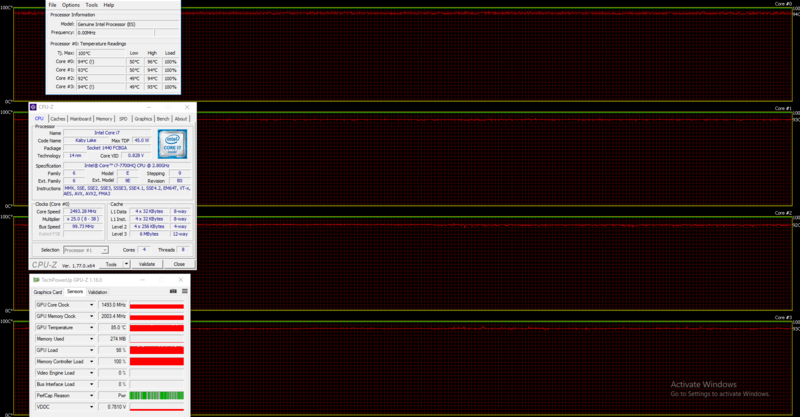 The maximum dE2000 (color deviation) compared to the center of the screen should not be above 4.0 if the screen is going to be used primarily for color-sensitive work. However, this one is going to be used for gaming and it’s still under 2.0 – an excellent result. 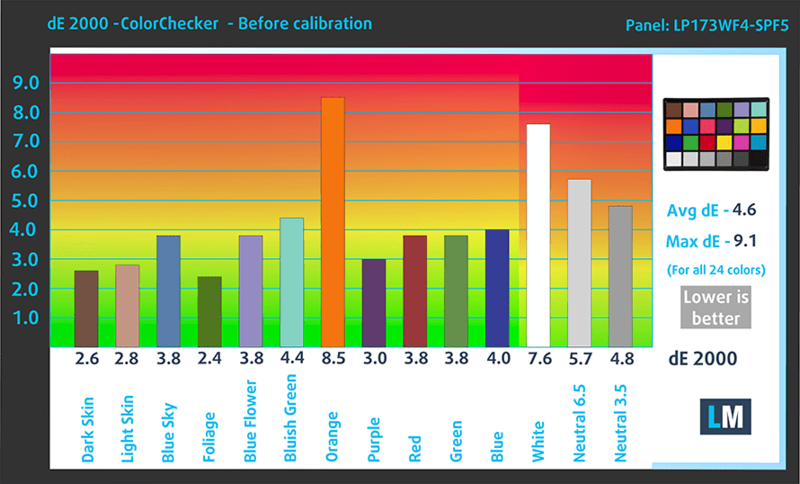 The contrast ratio is also pretty good – 1070:1 (1030:1 after calibration). The display covers 89% of the sRGB color gamut making it ideal for multimedia and gaming. 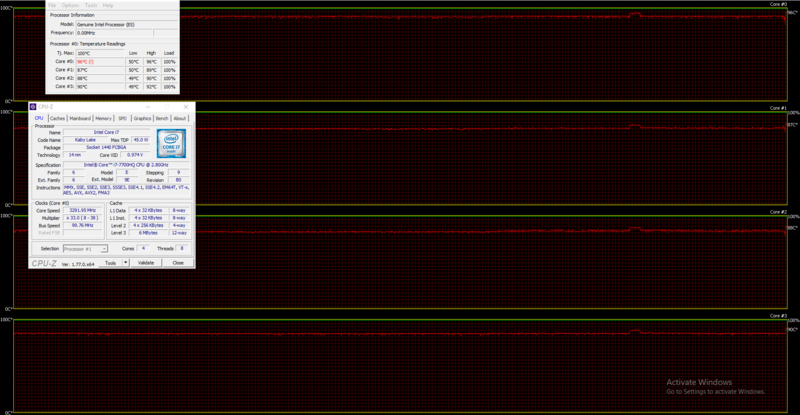 Only ultra-high PWM was recorded at times (120 kHz), which basically means no PWM so it’s safe to use for long periods of time even from users with sensitive eyes. The display’s quality should suit everyone’s need when it comes to gaming and multimedia. It supports G-Sync, it has high maximum brightness, high contrast, wide sRGB coverage and doesn’t use PWM for regulating screen brightness. We used the pre-installed Windows 10 Pro for the writing of this review but if you wish to perform a clean install of the OS, we suggest downloading all of the latest drivers from ASUS’ official support page. Despite the notebook carrying a generous 64Wh battery, the power consumption is higher than we expected so battery runtimes are pretty bad. So don’t expect long runtimes away from the plug. 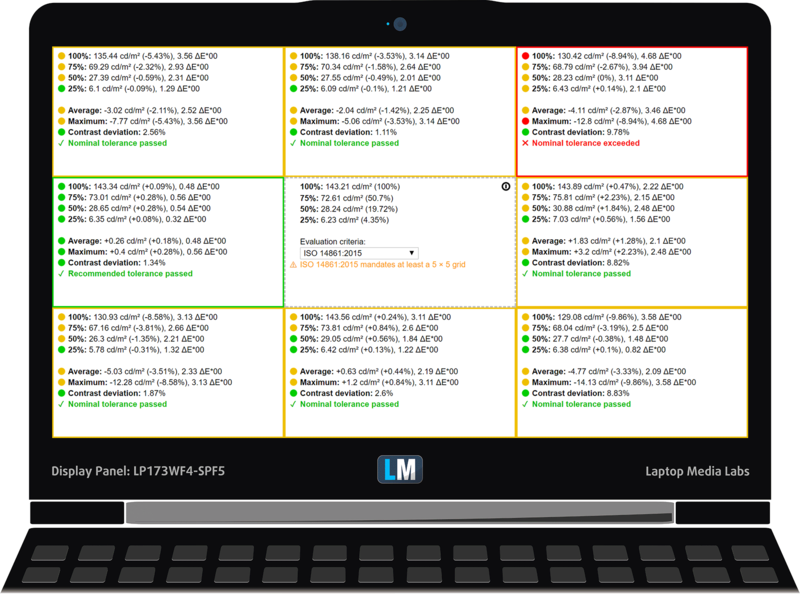 Of course, all tests were performed with the usual settings – Wi-Fi turned on, screen brightness set to 120 cd/m2 and Windows battery saving feature turned on. Pretty short runtime on the web browsing test – 220 minutes (3 hours and 40 minutes). Even lower video playback score – 182 minutes (3 hours and 2 minutes). Of course, the laptop isn’t made for gaming away from the power source but it’s good to know that it can run for almost an hour – 53 minutes. Fritz is a chess benchmark that tests the computing capabilities of the CPU with various chess moves. The Intel Core i7-7700HQ scored 13.712 million moves per second. In comparison, one of the most powerful chess computers, Deep(er) Blue, was able to squeeze out 200 million moves per second. In 1997 Deep(er) Blue even beat the famous Garry Kasparov with 3.5 to 2.5. NVIDIA’s GeForce GTX 1060 GPU aims to be the mid-tier graphics card from the Pascal generation offering similar or even better performance than last year’s flagship models like the GTX 970M and 980M. However, the GPU will be used in high-end laptop configurations. The usual stress tests that we perform can’t represent real-life usage because even games don’t require 100% CPU and GPU load but the torture tests remain as the most reliable way to assess the overall effectiveness and stability of the cooling system in the long run. 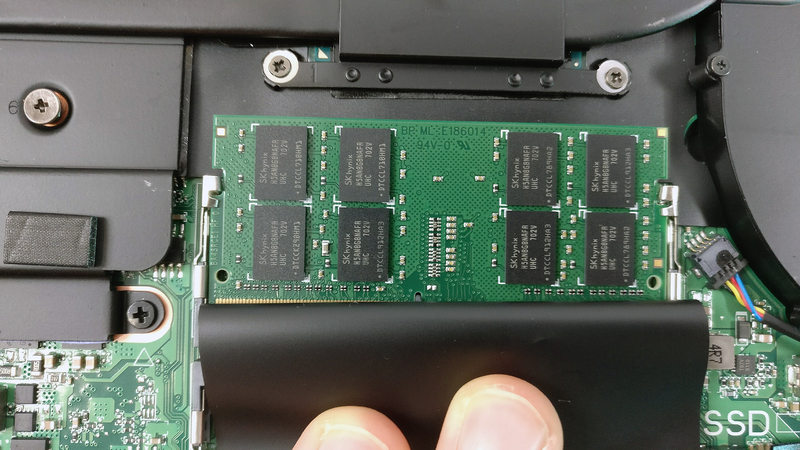 We kicked things off with 100% CPU load for about an hour and the Core i7-7700HQ ran at its maximum operating frequency for four active cores before staying stable at 3.3 GHz. Operating temperatures were a bit high, though, and one of the cores was running a few degrees higher than the rest as you can see from the screenshot below. Turning on the GPU stress test resulted in small CPU throttling – 2.4 GHz and, of course, high temperatures. The GPU, on the other hand, surprised us by maintaining fairly high clock speeds – considering the nature of the stress test – but at a cost – high temperatures. 85 °C is quite toasty to be honest and we’ve seen such temperatures only on laptops with GTX 1080 on board. In any case, though, we are glad to see minor CPU throttling and full GPU utilization regardless of the high intensity of the tests. But as expected, high inner temperatures often translate into a warm interior surface. In this case, the heat map shows higher surface temperatures around the center of the keyboard but the only really hot area is right between the hinges (60.5 °C) where the main heat-dispersing grills are located. It’s a good thing that the palm rest and the “WASD” area remained cool throughout the whole test. 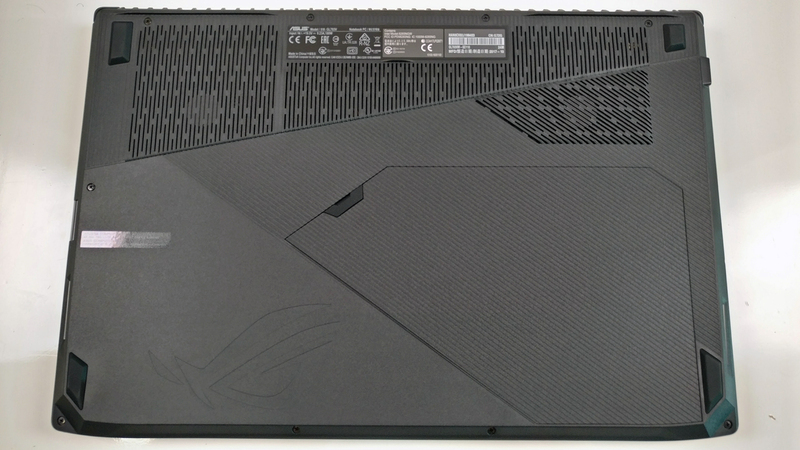 The best ROG laptop from the GL-series? Probably yes but is it enough to be called the best in class? Well, again, it really depends on what are you looking for. The GL703VM offers some cool features rarely found in GTX 1060-powered notebooks including a 120 Hz G-Sync-enabled IPS panel, which is optional but still… It’s also pretty thin and light for 17-inch notebook so you get portability along with the excellent performance to some extent. But even if you go for the standard 60 Hz that doesn’t have G-Sync, you will benefit from the high contrast ratio, high maximum brightness, wide sRGB coverage and virtually no PWM – ideal for long hours of gaming or other multimedia activities. However, the missing G-Sync doesn’t mean the laptop boasts great battery life either and it makes us wonder why the NVIDIA Optimus feature isn’t active. On the other hand, the lack of premium materials and questionable base stability, it’s really hard to recommend over Lenovo’s Legion Y720 and Dell’s Inspiron 15 7577 in this regard. It’s just a little bit better than the Acer Predator Helios 300 (17-inch). 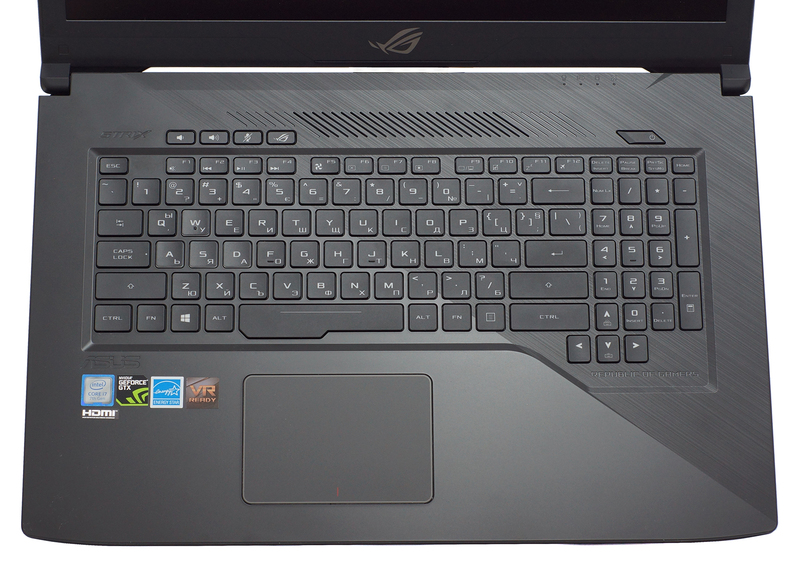 In addition, the touchpad is comparable to some low-end gaming laptops with GTX 1050 while the keyboard is a mixed bag for gamers – longer key travel would have done wonders. In terms of cooling performance, the GL703VM’s system is a hit and a miss at the same time – even extreme workloads weren’t enough to cause major throttling issues (or any of that matter) but you will definitely feel the heat coming out of it in the middle of the keyboard. It won’t be a huge issue when playing games but it’s important to consider. So if you have the spare cash for the 120 Hz version, the GL703VM is definitely the way to go due to its well-utilized powerful hardware, fairly portable chassis and good value overall. 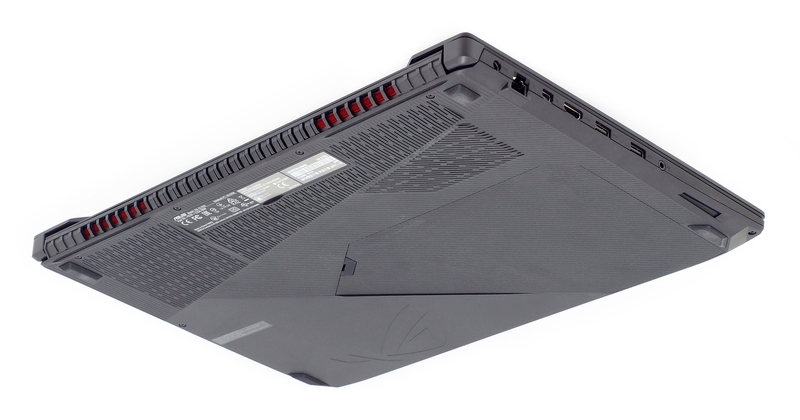 But if “bang for the buck” is what you are looking for, probably the Predator Helios 300 from Acer will suit you better. In terms of build quality, the Lenovo Legion Y720 is far superior but disappoints with subpar display quality. 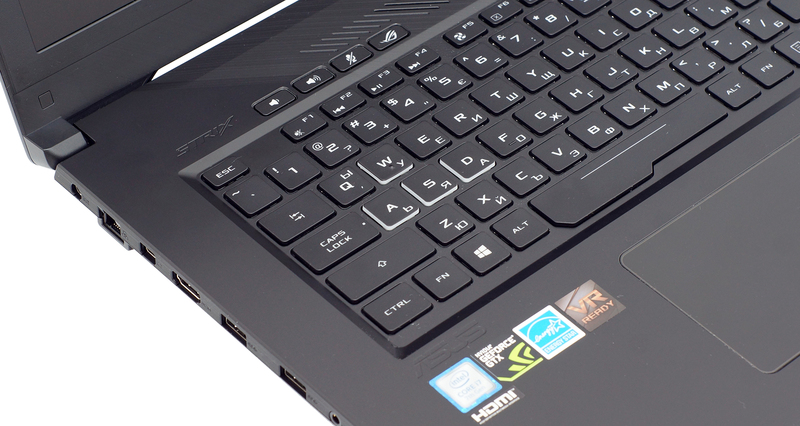 The Acer Aspire V17 Nitro BE is also an option although, it is not a gaming-centric machine. 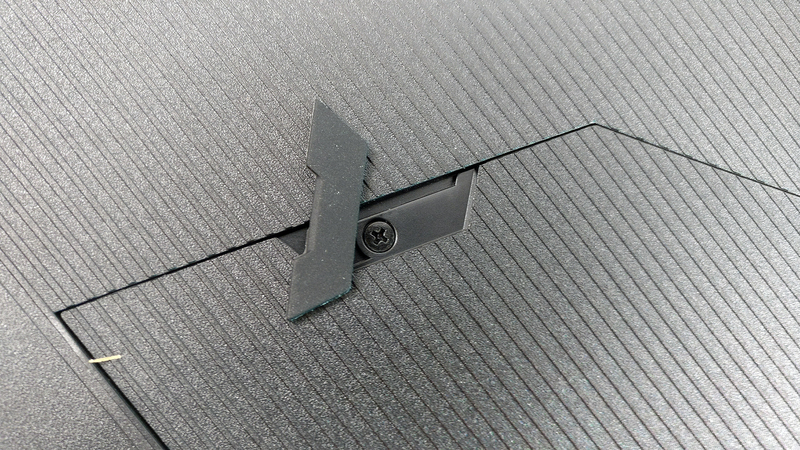 Clearly you didn’t read or handle this laptop Paul. The con that samer mentions of optical drive is because this laptop has no CD / DVD drive, that’s what optical means. The 1tb drive (or larger) is a SATA HDD, and it is NOT an Optical drive.